On Monday afternoon, the historic Notre-Dame cathedral was engulfed in flames — an incident that has spurred mourning both online and in the Paris streets, where people coalesced to grieve the devastation of the iconic 12th-century landmark. Here’s everything we know so far. At approximately 6:50 p.m. local time, firefighters were dispatched to the Notre-Dame cathedral, out of which flames and black smoke were billowing. It wasn’t until 11:30 p.m. local time that the fire was reportedly contained. Do we know the cause? An immense amount. CNBC reports that both the spire and the roof collapsed and that the flames spread to one of the cathedral’s towers. “We can do this,” he continued. As France 24 reports, firefighters were able to save the cathedral from “complete destruction.” As of Tuesday, both towers are still standing and per CNN, many of the cathedral’s most valuable pieces of art and artifacts were saved: notably, the Crown of Thorns, Tunic of Saint Louis, the Great Organ, the Rose Windows, and the Mays de Notre Dame paintings. Per Paris police, there have been no confirmed deaths and no reported injuries. In Paris, the night of the fire, locals gathered outside the cathedral to weep and mourn the devastation through hymns. Some people, such as Salma Hayek’s billionaire husband, have offered financial support. 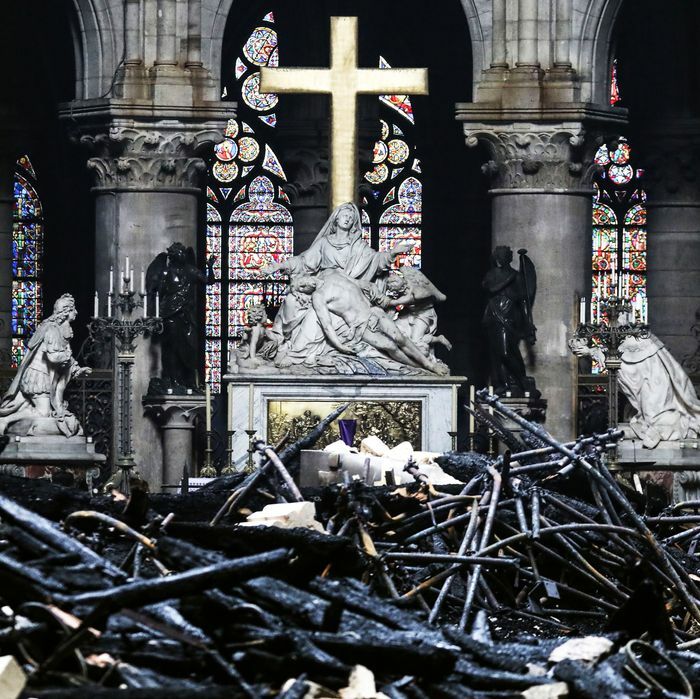 On Monday night, François-Henri Pinault — who’s the CEO of Kering, the luxury-goods group that owns Gucci and Saint Laurent — announced his family was donating €100 million ($113 million) to help rebuild the cathedral.